I was thinking about a red candle for the honey jar spell for a love spell. If I'm using a red candle for the honey jar would it work if I let the candle burn in one day? A red 4" is typical to be carved with a petition then dressed with oil as you pray over it. Then you would light it on the jar as you pray. You let them burn out. Unless you have to put it out then snuff it never blow it. Can cinnamon used for honey jar love spells? Yes cinnamon or ginger are used to heat up love work. Cinnamon, Cardamom, Ginger, Cloves, and Grains of Paradise are all spices that heat up love work nicely. Ok so here's how I'm gonna do my honey jar love spell. What I'm gonna do is add a pinch of ginger on the girls photo. As I'm adding the pinch of ginger I'm gonna say ginger help Angelia fall in love with me. If I get cinnamon I'll add a pinch of cinnamon and say cinnamon help Angelia's love be romantic and true while adding the cinnamon. After I'm done with all that I'm gonna fold the photo towards me. Then I'll turn the photo counter clock wise, and fold it again till the photo can no longer be folded. When I'm done with the photo, I'll open the jar of honey and eat three spoon fulls. As I eat the three spoon fulls of honey I'm gonna say as this honey is sweet to me so shall Angelia's love be sweet to me. After that I'm gonna put the photo in the jar of honey and push it down in with the spoon. Then I'll close the jar, take a small red tea candle or pillar candle depending on the size of the honey jar, light it with a lighter, let it burn all day or unitl it burns out. When the top of the jar and lid is completely covered with the wax I'll snuff out the candle let the wax harden, put it in a safe place and call it good. Do I have the right idea on how I'm gonna cast the spell and what signs do I need to look out for that it's working? I would recommend ordering the book on honey/ sugar jars it is filled with detailed information on how to make a jar and different ways to use it. Items that would be great for a love honey jar would be one of : cinnamon or ginger to heat it up, rose petals for love, magnets to draw, we use lodestones in hoodoo and they match the stones, cardamom for luck in love, juniper to increase passion, coriander seed draw love. Just some ideas I will post a link to herbs from cats page. If you have a personal concern add it or use the photo. Write on the back of the photo write her full name going across in a diagonal line and then yours to cross it creating an X . Around it write your petition without lifting the pen in a circle: "Angeliacometomeandlovemenow" . Fold it 3 times turning to the right and to you. I dont use a lighter I only uses matches. The way you are asking to work the honey jar is very passive, light the candle then call it good. Rootwork means that working with the root. It is very active not a passive process. A honey jar is two spells combined a container spell, and a candle spell. Most workers burn a candle on the jar every Mon-Wed-Fri, while praying and reciting Psalms and Songs of Solomon over the jar. Burning candles on top regularly will also provide signs in how the candle burns and the wax symbols it leaves behind. This will indicate how the work is going. Try and get 4" candles, carve the petition on the candle and dress the candle with a love oil. Pray over the candle, place it on the jar, light it, pray and let it burn out. Signs are personal to people and can vary, some ideas are hearing the persons name, seeing them, hearing there name in context of the work, watching a tv show and suddenly an Angelia says she is in love, you are at the grocery store and you see a pastry called Angelias honey cake, dreams, visions, etc. When something is happening and I am getting signs the persons name and the relation to the work will be everywhere I turn to the point it is taunting me lol. Magic does not take the place of mundane work too, therefore get out and mingle, go where this girl goes, talk to her, ask her to do things. Wear the love oil when you do. Will the Honey Jar candle will still work if I let the candle burn all the way until it burns out in one day? Many people set small lights on a honey jar and let them burn out in one day. The next day, or a few days later, they burn another small candle light on the honey jar. The work of setting the lights may be done one time or several times, as you wish. Also, as mentioned several times already, you do not need a candle to perform a honey or sugar spell. Yes people often burn one candle a day and let it burn out. Then repeat the work Mon-Wed-Fri on the jar. a 4" candle burns about 2 -3 hours, a skull candle will take many hours, depending on how well it burns can be easily 10. For my honey jar if I got one of those small tea light candles that burns for an hour, light it on a Monday and let burn all the way out would the spell still work? You can burn a tea light and let the candle burn all the way down. Take the tea light out of the tin dress it with oil, put it back in the tin and place it on the jar and light it and pray over it while focused on the desire of this girl and her loving you. Would my honey jar candle work if I don't anoint the candle with oil? The honey jar in itself is a container spell and works to draw the two people together. It is worked often because it works so well, with a candle. The candle is dressed with condition oil, condition oil is oil relating to the situation ( condition) of the work, such as love me oil to make a person love you. So short answer yes a honey jar works with or without a candle, but it is a great additive and continued work to add the candle. Try using olive oil on the candle that you pray 23 Psalms over until you can order a condition oil. Oils are good for other reasons outside of candles: dress yourself with them when you see the person, put on items she will touch, add some oil to a bath to get it on your body when you go on a date with her, dress a mojo etc. Which oil would work best with my honey jar love spell sandle, ylang ylang or either one? Lucky Mojo has a great range of love oils to choose from to use with your honey jar, depending on what you're trying to do. My suggestion would be to go to the following page and read the descriptions of the oils, and go from there. If you have a question about a specific oil, just let us know! But which would work best for anointing the candle sandlewood or ylang ylang? If you're choosing between sandalwood and ylang ylang, I would use ylang ylang, and Lucky Mojo does carry both. And all of our Lucky Mojo honey jar spell kits are listed and offered for sale at the bottom of that page. Plus -- Lucky Mojo has published the extremely popular book "Hoodoo Honey and Sugar Spells" -- an incredible selection of sweet spells by Deacon Millett of AIRR, filled with recipes for making your own sugar scrubs, sweet bowl spells, honey jars, and honey baths! This is the information you have always wanted, all bundled together in one easy-to-read compendium. Ok after I cast my honey jar love spell what signs would I need to look out for so I know it's working? This extremely active thread, which has been compiling since 2009 and has 1960 posts to date, is THE place to read up on signs, hear what others have to say, and ask your questions -- that is, if you still have any questions after reading through all 33 pages of questions and answers! For my honey jar love spell would the spell still work if I lit the red candle on a Monday and let it burn all the way out? A honey jar like any spell either works or it dont. The jar is a spell so either it is sweetening her or its not. The candle burned is a spell either its working or its not. Now you are setting a red candle on a Monday, what else will you be doing with the work? Pray over it? Light candles on other days? If I can't find any oils to anoint my candle with would my honey jar love spell still work? Candles are not a requisite part of honey or sugar spells. First off a big thank you to everyone on luckymojo.com for helping me with the information about my honey jar love spell you have been very positive about this. I have put a lot of thought on how I'm going to cast this spell. You have no idea how nervous and excited I am. This is my very first hoodoo spell. I look forward to the day when I can hold the girl, hug her, kiss her and tell her how much I love her when the spell works. Again thank you everybody. Now, I have two different versions of the honey jar spell. You take the ginger and put it in the middle of the photo/ or name paper. As you are putting the ginger on the paper your gonna tell the ginger to help (name of person) fall in love with me truly. As you are putting the catnip on the paper your going to tell the catnip to help (name of the person's) love be romantic and true. After you put the herbs in the middle of the photo/ paper your going to fold the photo/paper towards you. When your done fold the paper counter clockwise. Keep folding the photo/paper counter clockwise till you can't fold the photo/paper anymore. Now your going to open the honey jar. Get a spoon out and eat three bites of honey. As you eat the honey your going to say as this honey is sweet to my so shall (name of person's) love be sweet to me. Then you place the photo/paper into the honey jar. If you have to use a spoon to push the photo/paper down into the jar. Now you close the jar up. Now your jar is ready for the candle. Your going to light the red candle on Mondays, Wednesdays, and Fridays. Apply a drop or two of the Sandalwood oil in an upward motion. As you anoint the candle your going to say you are going to help (name of person) fall in love with me. Light the candle and say may (name of person) fall in love with me. You can let that candle burn completely out without blowing it out. * Photo of person who wish to enchant or if you have no photo, write their name on a piece of paper. Take the name/picture of the one you wish to enchant and simply place in the jar of honey . Seal the jar and place the red candle above, letting it burn completely so that the wax from the candle seals the jar. Place the jar in a secret place until your lover has responded to you. Take the jar to and bury it when you have achieved your desire (i.e. you got married to the person or are moving in with them, etc…). So there you have two different parts of my honey jar love spell. Now which one would really work -- version 1 or version 2? I really need to know before I cast the spell. There are three dozen more versions of this spell that you have not even mentioned! If you read the web page i pointed you to, you will know that -- and know why. Okay, so of the two versions you selected, i think Version 1 is a lot more traditional than version 2 because it calls upon the spirits of herbs and roots for help (This form of magic is called "rootwork," after all). However, you lost me completely at the question, "which one would really work?" Now you are back to square one, and the question, "Does magic really work?" Does Magic Really Work, and If So, How? Would version 2 of my honey jar love spell still be okay to use? If I do use version 2 would it really matter if I buried the jar or kept it? I am sure that you will do as you please, and since magic is not guaranteed, because it is an art, you will just have to do what you want to do and see what results you get. You are in a thread on honey and sugar spells that is 115 pages long and contains 6870 posts of questions and answers -- all of which you can read for yourself. We have given you many links to free web pages that i have written about hoodoo honey and sugar spells. 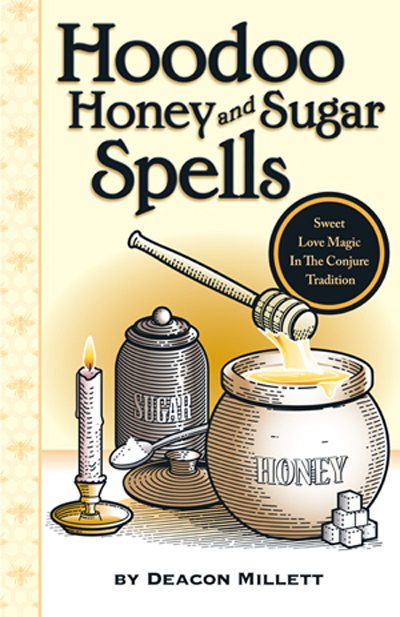 We have recommended to you the best book ever published on honey and sugar spells. We have answered all your questions. Now it is time for you to do the work. Hello, Everyone.... I'm new here and only dabbled with hoodoo, so far. Could you do a curse on someone after previously doing a honey jar on them, which included your photo tied to theirs? I was told you can't curse someone after doing a jar on them and that I should never destroy one. The person is a horrible social worker who unjustly separated me from my child for a long time. She has a track record of abusing other mothers as well. I tried going the nice route with the honey jar, which didn't work for me. The CPS case has since closed after she finished toying with my life and I have my child back. Now, I just want justice and revenge. I'm thinking of doing a D.U.M.E candle on her. Thoughts? What should I do with the jar after it works, the girl and I find move in together or get married? Should I bury it or keep it? I keep my marriage honey jar on the altar, because my husband and i are both rootworkers. If my husband did not like magic, i would bury it in the back yard or in a potted plant (sealed) where it could not be seen. Either way works just fine. Your choice. Would it be ok if I cast the spell on Mondays, Wednesdays and Fridays at 12/1:00 in the morning because I'm still awake around that time. Yes you would clean the honey jar out leaving the contents at a tree stump or running water. Then you clean the jar or recycle it. There is no rule you cant curse a person you did a honey jar on. It would not make sense to curse and do a honey jar at the same time. But in your situation it makes sense. DUME is death unto my enemy, so if a death spell is justified yes. Other options are cursing, crossing, jinxing. You can, normally to draw things to you, you would work with the houses of the hands on the clock moving upward to bring to you, and to send away as the hands are moving downward. Some people use planetary hours as well. Thank you very much, JayDee. When you say tree stump, do you mean a cut down tree or just the place the jar contents at any tree trunk? I'll be sure to check out the links you posted! This happens more often than you might think, MochaGypsy. Once attempts to sweeten a hard heart fail, you naturally want justice. After properly disposing of the honey jar, do what you must to obtain justice. You may want to to consider petitioning Father Black Hawk. As I'm waiting for Wednesday at midnight to roll around to cast my honey jar love spell I would like to hear positive stories from people who have cast the honey jar love spell. For the people who have cast the honey jar love spell what were your experiences with the results are you still with the same person and do you have children with that person? Share your stories with me maybe I might have the same experience. MochaGypsy, I am noy JayDee, but i believe he means a tree stump. Otherwise he would have said the base of a living tree. I have done that, and also under a rose bush. daulton, i second JayDee's advice that you buy the $9.00 "Hoodoo Honey and Sugar Spells" book. There is SOOOOO MUCH in that book that will help you. A quick answer to your question. My husband and i made a honey jar together and are still together after 20 years. Well the spell has been cast. The hardest part was lighting the candle. It took several attempts and I kept saying may Angelia fall in love with me every time. But the candle wouldn't light. Finally after playing with wick and saying may Angelia fall in love with me the candle finally lit. 1. Is that normal with the problem I had lighting the candle? 2. s that ok or do I need to recast the spell? Good for you, Daulton. You did it. 1. I sometimes have trouble lighting candles. That's why I buy from dealers like Lucky Mojo -- they don;t sell cheap discount store candles. A difficult light may not mean much. Wait and see when you light your second candle. If it keeps happening, buy some better candles. 2. As you burn more candles, more wax may melt onto the jar. Sometimes it does and sometimes it does not. Depends on your candles, and also on the temperature in the room. If there is no wax, no big deal. If there is wax, you can try to see pictures or images in the wax and that may give you an idea. You are on your own for interpreting the pictures, though. They cannot read your candles for you in this forum. Congratulations on starting your spell. Even though there is some wax on the lid, I should be ok then? daulton, I agree with DATZZZ. The amount of wax -- if any -- depends on the kind of candle. "Okay" or "not okay" would not relate to the kind of wax. I have burned many candles in my 50 years of this work -- some drip wax and some do not. As a worker, you learn to "go with the flow" in matters like this. Thank you, Jon for letting me know about Father Black Hawk! He seems like the very spirit I need for help. I asked if I could work with him and I'm waiting for a sign. Thank you for clearing that up for me, Catherine. I'm currently out of town visiting family while my honey jar love spell was cast. Would my carry on bag be a safe place to keep my jar until I get home and hide it in my closet? Thanks again for your help. I look forward to the signs as dreaming about Angelia and seeing her around and having conversations with her even though she's not there physically. Having conversations with Angelia even though she's not physically there are part of the signs right? But, no, empathic or spirit conversations are not signs. They are spirit conversations. Hey thanks again everybody. Looking forward to holding Angelia hugging her, kissing her, telling her how much I love her and bringing her back to my home state of Pennsylvania to meet my family and friends which is where I'm at and where the spell was cast. Thanks again everyone. MochaGypsy, my pleasure, and good luck with Father Black Hawk. If you go over to the Crystal Silence League Radio Hour show archives, we did a series of programs about him. So far I'm pleased with the burning of my honey jar for my ex-- the flame is always pretty hair and it dances/bounces as well-- but today when i looked on his current girlfriends social media profile they seem so in love and it sickens me! Don't get me wrong, I have faith in my work.. I just can't wait until it manifests! I also have a vinegar jar going on them, a painted bottle break-up spell, and a lemon spell-- that i sort of mixed with a freezer spell and intend to redo-- I JUST not even 10 minutes ago buried the lemon in the graveyard with my grandfather and asked him to help me make this relationship die and bring my family back together! One more question. My honey jar love spell was cast on Wednesday at midnight. Since I'm a newbie to hoodoo and the wax only covered the front part of the jar, how long would the spell averagely take to work? There is no set rule like, "It will happen in X days". Trying to decide if I should get two more candles for my honey jar spell or leave it alone since the spell has already been cast and has a little bit of wax on the front part of the jar which is normal. When you started this process, you said you would burn the candles Monday, Wednesday, and Friday. If you now want to stop after just one candle, that is fine as well. Now, i hate to do this, because i know you are a nice person and mean well, but i am going to have to give you a time out from the forum. I have had to delete 10 of your posts that were repeated and redundant or placed in off-topic sections of the board; you are not a customer of the shop; you are perseverating and obsessing; and our attempts to reply to you are overworking our moderators. I have deactivated your account and returned you to the status of a "Visitor" account that needs moderator approval for each post. You will still be able to read the forum, but we cannot spare any more resouces for you at this time. Again, i wish you all the best, and i am sorry i have had to deactivate your account, but we are not set up to deal with your style of posting. 1) Candle Divination, Wax: I was working on my honey jar and i light a red candle on the jar. I saw last few times of candle burning, It burn leaving two wax stick up. Last night on the lid has two wax stick standing together left and middle burned had wax down one side to the jar. Any idea why this two wax stick show me? Sorry, I know no help with candle readings, I could not find any info. 2) Spell Remnants, Herbs: I placed my LM order reconciliation kit and hotfoot, reconciliation oil. While i waiting for that, I did a pink candle burning with a petition. I left the petition under the saucer and light a candle with inscribe our names and word reconcile sprinkle catnip, damania, balm of ghliead. And apply my body fluid on the candle. Should i continue this until my order come or bury it in the front yard? 3) Spell Remnants, Wax: Other thing is my honey jar wax getting fill on my altar clothes. When i am out i hide it wrap it with the clothe i am using. What should i do with these burned left over wax? 1. I am not sure I completely understand, it sounds like you are saying the wax from the candle left two sticks of melted wax left standing up? This would seem to be that it dripped from the candle when it burned, if that is it I would read that as tear drops. 2. You can continue this while waiting for the supplies. It is a new moon today, this is the perfect time to burn candles to draw a lover back, the full moon is September 24th. 3. Normally people let the wax build up on the jar. If you want you would take it off and dispose of it in your backyard or house plant to draw to you.